SAN FRANCISCO— ­For the third installment of the San Francisco Arts Commission’s (SFAC) Sanctuary City Art on Market Street Posters, Oakland-based artist Weston Teruya created a series of objects to explore the alliances and self-organization of communities that have faced injustices, xenophobia and gross disenfranchisement. The posters will be located in the bus kiosks along Market Street between the Embarcadero and 8th Street. 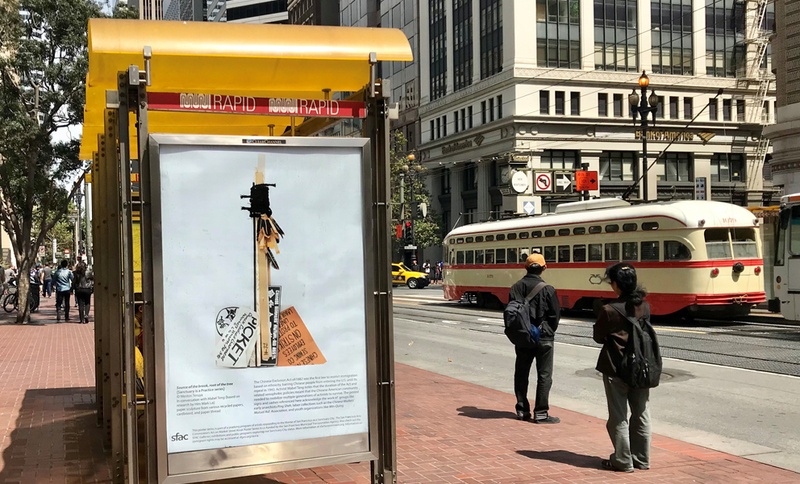 For its 2018 Art on Market Street Poster Series, the SFAC invited artists to respond to “what it means to be a Sanctuary City in today’s political climate”. For his series, Sanctuary is a Practice, Teruya created six amulets, some of them in collaboration with other artists. The amulets were crafted with symbolic artifacts representing different groups and people. Through his work, Teruya explores the complexity of social dynamics throughout history and the present. Each amulet is presented in a poster with a short explanation of the story it means to portray. Some of the talismans refer to the protests of the Chinese American community against the Chinese Exclusion Act of 1882, the support of the O’odham people to the Japanese Americans incarcerated during WWII, among others.